Occasionally, in the midst of a discussion about our Civil War, someone makes a remark that downplays the war’s significance, stating something like, “Well, I don’t think it’s affected me,” or “I no longer think it’s relevant,” or “None of my ancestors fought in it so my family wasn’t affected.” I’ve been told that our Civil War has been “over-romanticized.” Last week, someone commented that the Civil War has been “dulled by the casualties of the world wars fought in the twentieth century.” Many think that my passion for learning, imagining, teaching, and writing about the war between the states has to do with some desire to relive that time period. Actually, I can think of few things that would be more horrifying than experiencing our Civil War first hand. To these people… and others who believe that historians are making a mountain out of a molehill in terms of the Civil War: If you want to understand the effect that our Civil War had on the population of the United States in the mid-19th century, then you need to understand the numbers. Only then can you grasp how each and every family in the United States, north and south, was impacted by the events from 1861 through 1865. Recently, I shared a post on The Iron Brigade in Media page dealing with Professor Gary Gallagher of the University of Virginia insisting that if one wants to teach about the war, they must understand what a “Company” was. I added to this, stating that, although the numbers are important, a civil war company is a cross-section of the community in which it was formed. 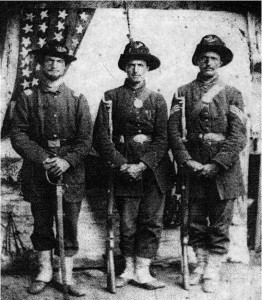 Often, a company (usually composed of 100 men) consisted of men that all came from the same town, city, village, or county. They shared the same culture and a common past… and sometimes when a regiment got into a hot spot on a battlefield an entire community lost its husbands, sons, and brothers. But this article is about numbers. Even if we forget that companies are anything other than 100 men fighting together for a common cause, they are infinitely important as logistical statistics. So are regiments, brigades, and corps. Casualties, in the form of Killed, Wounded, and Missing are almost always measured in two ways: Numbers and percentages. Let’s apply the numbers and percentages from our Civil War population to the population of our country today. The population of the US in 1861 was roughly 31 million people. Today, our population is approaching 315 million people. That means that today there are almost exactly ten times the amount of people living in the United States as there were when South Carolina seceded from the union. This makes it convenient to compare figures from both time periods in an easy to understand formula, the power of ten. Here’s an example: When President Lincoln called for 75,000 volunteers after the fall of Fort Sumter, we can assume, based on percentage, that today he would call for 750,000, based on the power of ten. Now, please allow me this disclaimer about numbers. The numbers listed below, except where noted, will either be rounded or estimated, and based on multiple sources or other factors. This will hardly have an effect on the application of our statistics, however. The shock value of our outcome shall retain its charge. If your source states that there were 5,000 more casualties at a particular site, please know that I understand that such discrepancies exist. Before we get back to the Civil War, let’s take a moment to look at some modern-day numbers. Roughly 2.4 million Americans have served in some military capacity in Operation Enduring Freedom, Operation Iraqi Freedom, and Operation New Dawn since 2001. Of the 2.4 million who have served, 6,750 men and women have died while in uniform, a number that is confirmed by US Central Command and concurred with by Military Times and their website, www.honorthefallen.com. This means that less than 3/10 of one percent of those who served over the last twelve years have been killed in the line of duty. Understand, I am not attempting to downplay the losses of our military since 9/11. I mean no disrespect to ANYONE. My son, an Army Specialist and engineer, came home from a nine month deployment last Christmas Eve. There are few families in this nation that do not know of a Soldier, Marine, Airman, or Sailor that has been lost in our twelve-year war against terrorism. Everybody, seemingly, can name a member of our military that has given his or her all in this, the longest war in our history… whether that person is family, friend, friend of friend, or an acquaintance of a friend. These wars have affected each of us through human loss, economic hardship, political turmoil, and a daily dosage of news coverage, filling our living rooms with all of it. Now, let’s talk about the Battle of Gettysburg. Common estimates list the total casualties at around 46,000, with the number of killed somewhere between 5,700 and 7,600. Giving these numbers the power of ten, total casualties based on today’s population would be roughly 460,000, with the total killed ranging from 57,000 to 76,000. The number of killed in action at Gettysburg would eclipse the number of Americans killed in all of the Vietnam War, again, based on today’s population. The Civil War saw roughly 620,000 Americans die. That’s 2% of the population. Notice that I didn’t say “2% of those who served.” Earlier, I wrote that 3/10 of one percent ( 0.0028%) of those who have served since 2001 have died in uniform. If we apply those 6,750 fallen to the ENTIRE AMERICAN POPULATION then the number is much, much smaller. So small, in fact, that my calculator errors when trying to figure the percentage. Applying the power of ten to the 620,000 who lost their lives in the Civil War, we see that today’s America would see 6.2 million die based on the same percentages. If we apply the 2% to today’s population, 315,000,000, we get 6.3 million. Imagine if 2% of our people lost their lives in war today… and not overseas, but in our back yards and orchards, cornfields and parking lots, in our city streets, school yards, along our riverbanks, forests, and mountaintops. Imagine how each of our lives would be affected then, with entire villages sometimes losing every young man who had once inhabited them. American families living during the civil war didn’t just know OF somebody who was killed, they were personally affected through the deaths of family members, be it their husbands, sons, brothers, nephews, cousins, and neighbors. Some families lost as many as four or five immediate members while losing their cousins as well. Throw in the obvious economic hardships, such as the rising cost of thread, fabrics such as calico and cotton, and the price of bread, especially for southerners. Imagine a post-war state budget where half of the money allotted went for prosthetic limbs for wounded veterans. This is exactly what occurred in Mississippi in 1866. 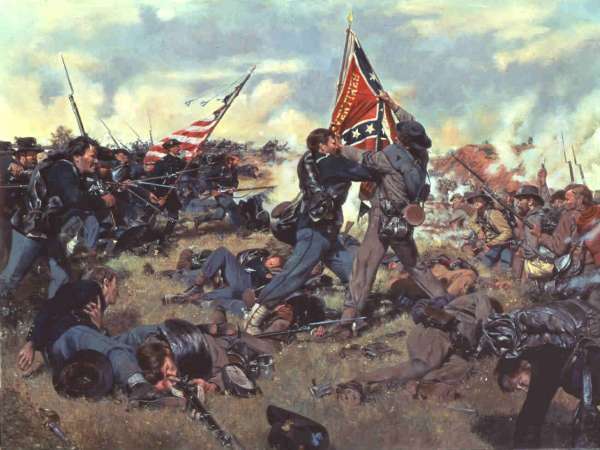 The Civil War is “over-romanticized?” Perhaps it is if you’re watching “Gone with the Wind,” “The Blue and the Gray,” or “North and South” rather than looking at the truth. If you ask me, none of us are paying enough attention to it.